Why do Christian leaders tell people that they should tithe? I don’t have the definitive answer but I do believe that I know something true about tithing. Tithing is not for the generous but for the stingy. Generous people need only hear of the need and they will meet it. They do not need a minimum compulsory amount. Church leaders feel the need to teach on tithing because they are leading a group of selfish people. Take the selfishness one step further and tell the “givers” that God will return even more to them if they do tithe. 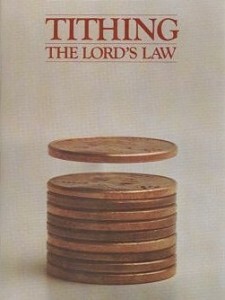 There was a time for tithing. God assumed selfishness in the unredeemed people of Israel and made provision for it. For those who have been implanted with the love of God, tithing has become obsolete. The saddest aspect of tithing teaching is when we presume selfishness from the redeemed, they begin to be selfish. Here’s what Paul said about a general legalistic approach, which would include tithing. Jesus wants his people to light the world. We won’t if we remain confined together. To reach ignition, we have to make contact with the world and face a little friction. A disciple of Jesus Christ whose whole attention is on the rest of the church is out of sync with his purpose. He’s not a match. He’s a mismatch.